Erina Macsweeney Nutritional Therapy | Targeted nutrition, resolving the underlying causes of ill health. Targeted nutrition, resolving the underlying causes of ill health. Next one April 24th! Limited places. Text 087 2740788 or email : erinamacsweeney@gmail.com to book! Free “mini” nutritional consultations at a store near you! If the age old message of “Eat Less – Move More” for weight loss is not working for you. 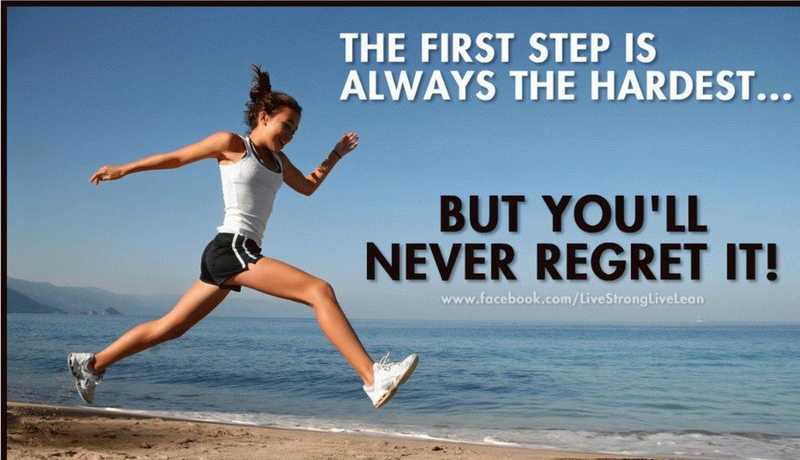 If you are pounding the pavements for years and still find keeping weight off a challenge. If you are concerned about belly fat being a “health risk”. How we burn fat and store fat is totally controlled by your hormones. Balance your Carbs, balance your Hormones! 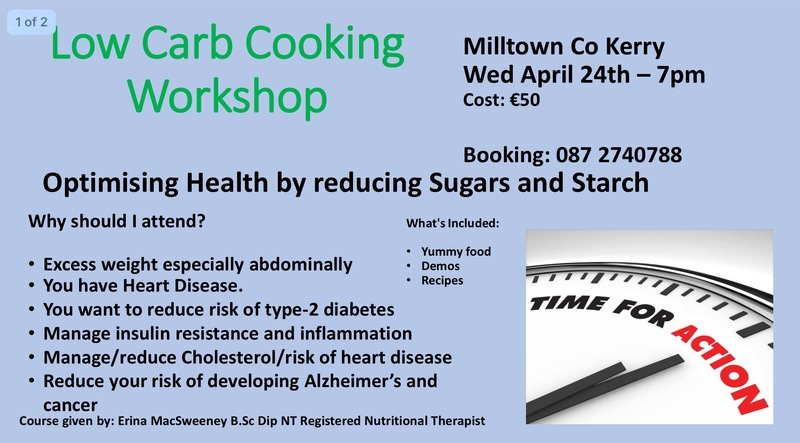 Come along and learn easy, manageable, and yummy ways to reduce sugars and starch in your diet. 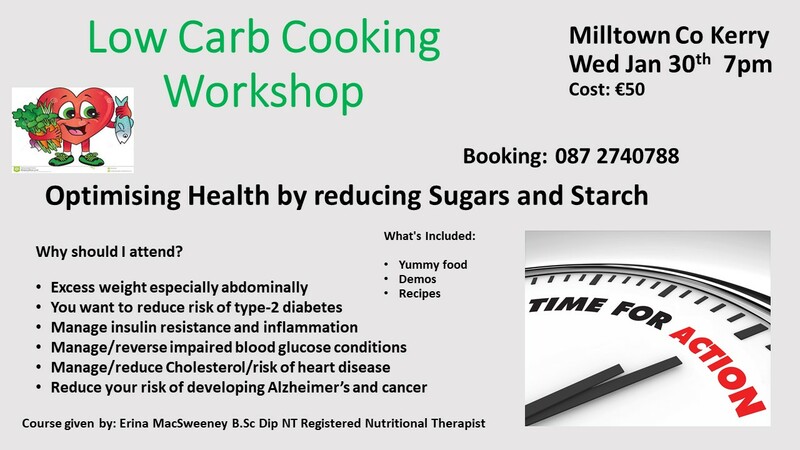 I’m running a cookery workshop on how to optimise your health by reducing sugars and starches. 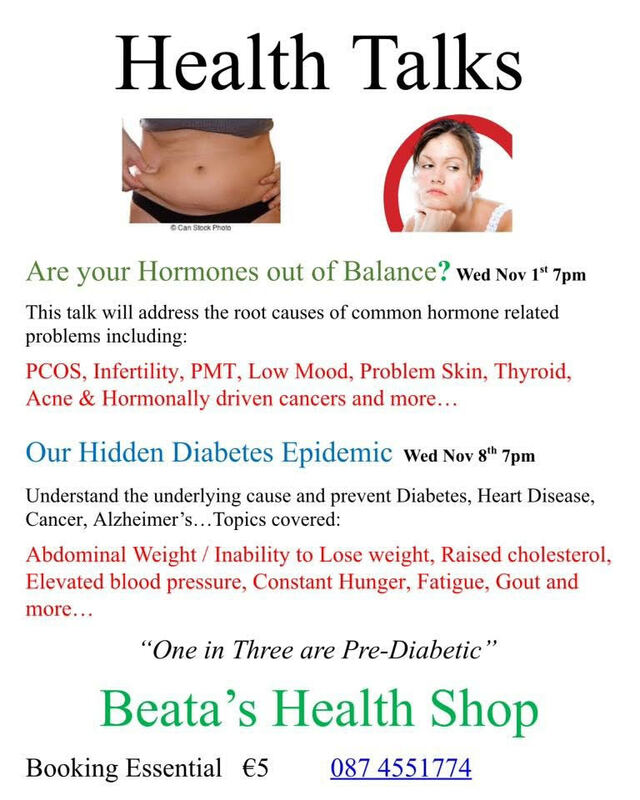 If you’d like to understand more about how these impact your health and how to reduce your risk of developing type 2 diabetes and other related conditions including how to manage your weight — this is the course for you! What are your genes saying about your health? Have you ever wondered about what genetic cliches you may have, is there something in your genes that could be dictating the state of your ill health? Your family history of heart attacks, strokes or even Alzheimer’s or other conditions? How much of this is because of your genes? Generic testing is now easier and more affordable than ever and it is proving to be an invaluable tool along side clinical assessments and the detailed consultation provided by your nutritional therapist. It is providing us with a clear picture of a persons health and is proving to very beneficial for my clients with chronic illnesses, conditions such as heart disease, diabetes, obesity by enabling me to target specific problems and design a tailored program. For a family member with a history of heart attacks, stroke and in particular dementia or Alzheimer’s it is really allowing very effective preventative actions to be taken. Could it help you? Understanding and using real wholefood for maintaining and achieving optimum health. Using food and nutrition in the prevention and support of common conditions including heart disease, raised blood pressure and cholesterol, digestive problems, inflammatory conditions, food intolerance’s and joint health etc. Special focus on the underlying cause, early detection and prevention of insulin resistance, diabetes, obesity and related issues. Enjoy tasting and preparing great, super healthy food, while learning life changing skills for you and your family. Book direct with the college.